Source Code * My Reading List | Klimafarm: Gesunde Nahrung. Gesunde Umwelt. Gesunde Profite. Here are some books I do recommend. What you do not see here are the many printouts of scientific papers I extracted from the Internet. I link these in my articles for the blog directly. I do not know yet how to link the Kindle Books I read and read currently starting with Rachel Carson (silent spring), not ending with Ashlee Vance (Elon Musk Bio). What you also do not see is the crap I read. I feel some books were not worth my time. One day I might post a warning sign here not to read them but this is not urgent. It is more important to show you the books I recommend and tell you why. Many permaculture books and people seem to lean towards paranoia and wishful thinking. That is why I am always very thankful for down to earth approaches like the road Mark Shepard is walking on. 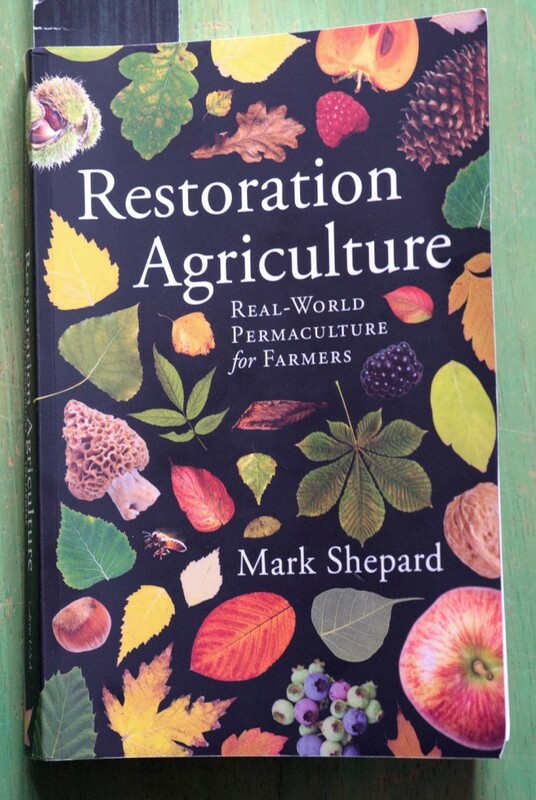 This is certainly not a text book on which alone you can errect your farm, but the points he works through are very thoroughly worked through and one can learn a lot from this „Real-World Permaculture for Farmers“ as the subtitle claims. A wonderful story-driven book with a great reading flow and an inspiring abundance of useful information whether you want to errect your own farm or only dream and talk about it. After reading this book you know what Permaculture is, what problems it might face and how it compares to classical annual agriculture. Just read it, you will not regret it. I love this book. This is who got me started: I was working on an organic farm in the 1980ies, we delivered milk and cheese from our goats, tofu products from our manufacture, bread and bread rolls from our bakery and many more agricultural products from our garden and fields to the near by city: To food coops and organic retailers. We also produced meat and eggs for our own use. 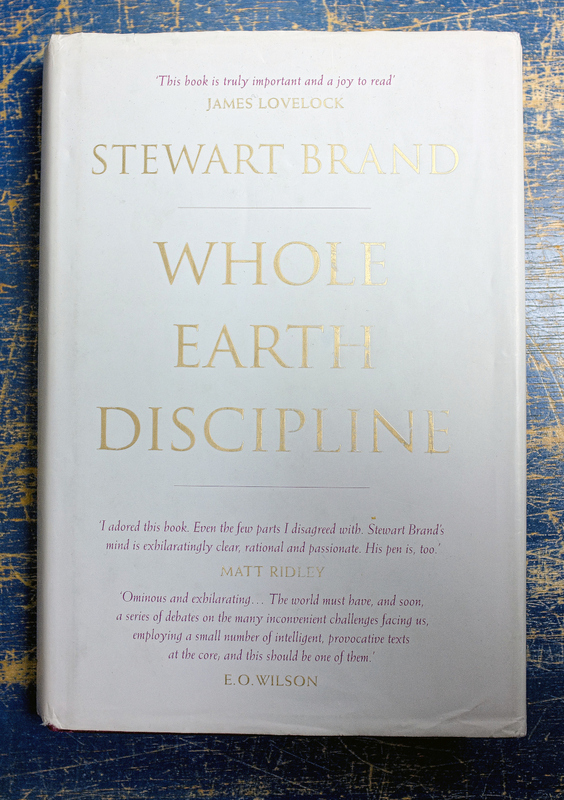 I read this book and I learned that the Rudolf Steiner method we used was not the end of a great development toward sustainable food systems but the beginning. 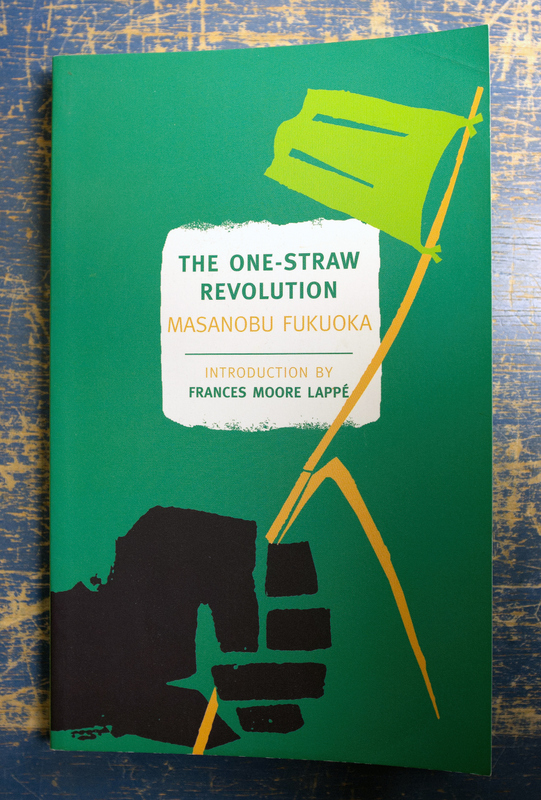 Masanobu Fukuoka shows in his classic work „The One Straw Revolution“ that we should really learn the workings of nature. If we do, we only have to add very little work, no external fuel and chemicals. Still we will be able to yield more food from our piece of land than the neighbour still bound to destructive agriculture. Masanobu’s basic question is not: „What shall I do?“ but „What should I better not do?“ It all started with his insight that we unbalance a system by doing too much or the wrong thing and this imbalance causes a chain reaction of having to do more and more to actively balance something that could also be sustainable and resilient in its own right if we would just let it be. Rereading the book today I felt that his esoteric impetus is sticking all over and his Guru-like appearence to be witnessed on youtube is distracting from his great simple message: „Natural farming“ means watching nature closely and understanding how little we have to do to make her work for us. 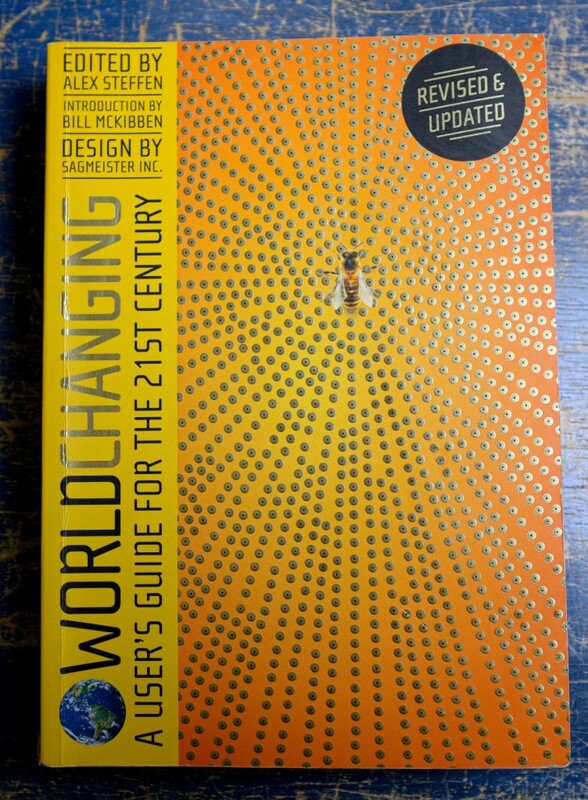 A Readers Digest – condensed edition – on the topic of climate change and sustainability, not a coherent depiction, this book represents collected knowledge of the authors’s „long now foundation“ in 2008. Sustainability means to alter one’s behavior to sustain human life on this planet for – say – another 10.000 years. Example: If you want electric power for everyone there seems to be no way but to replace coal fired plants by Thorium fired plants. 5) Complete failure of Germany to pull that thing off is proof enough for the rest of the world: at a projected cost of more 1.000 Billion Euros in subsidies promised by current law they did manage actually increase the spillout of CO2! Burning Thorium is the one solution that will power our world for the next 20.000 years, based on the knowledge of today. Since I wrote that I learend that Thorium is not the only viable solution, we can also use depleted Uranium or nuclear waste or natural unenriched Uranium to the same effect. What is more important is that we make these machines more secure that we take care that no accidents happpen anymore, anywhere. It is possible. The LFTR concept, a reactor burning Thorium and Uranium and nuclear waste is by orders of magnitude more secure than our best Nuclear plants today. And we have to rebuild the trust that was destroyed by an industry who always saw military use first and civil use as a byproduct. For me, military use is a no go and has to be impossible by design. Cheap green energy must be at center stage and the security of everyone: no transports of dangerous goods, not accidents possible that cause leakage of radioactivity, no dangeous waste that needs to be handled over long time periods. What a great read and just the book I originally wanted to write until I found it. 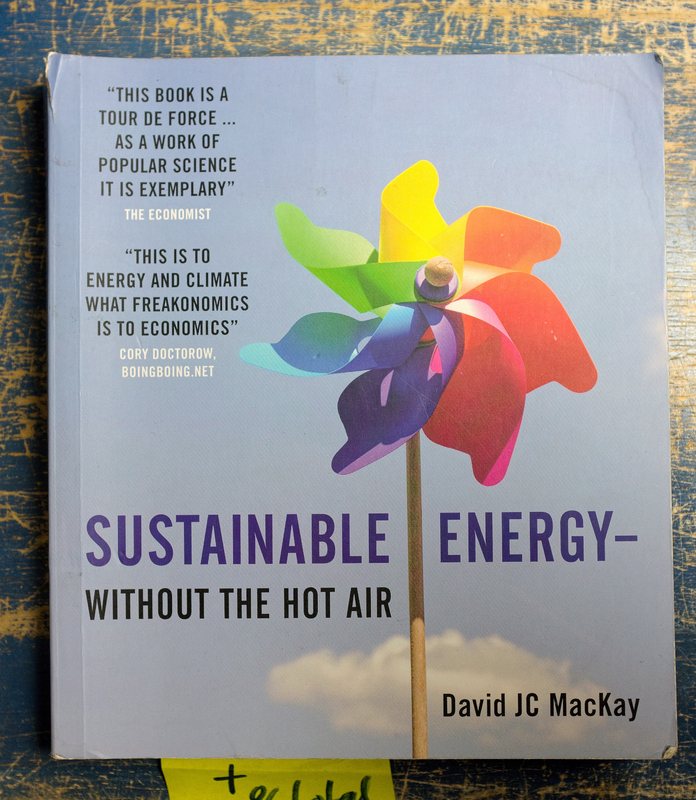 David MacKay is a physicist like me and his simple goal is to calculate which options for CO2-free Energy add up to the needs of humanity in 2050. It is a non profit book, you can get it for free here: http://withouthotair.com/ and verify it for yourself and your country. No ideology, just numbers. Wonderful. He asks: „Where does the wind blow? Let’s put windmills there!“ and „Where does the sun shine? Let’s put solar energy plants there“ and so on. Then he adds up all there numbers and finds how much energy all these renewable sources can possibly deliver. Just the physical constraints. No politics. No economics. Result: Even if we would want to and could afford to industrialize all our landscapes with power plants: Wind, Solar, Water, Tidal, Wave, Geothermal, Biofuel from plants, … it does not add up. From all of these sources combined we will be able to extract roughly 25% as the physical upper limit and it will be very expensive too. The number is for 9 Billion people, all using the amount of energy a very frugal energy user in Europe uses today: 80 kWh/day. If you drive a car and use a plane to reach your holiday destination, live in a detached non insulated house and eat a lot of meat you will use 3 times this amount easily. Solar-Thermal 24/7 power plants in the hot deserts (as there are in Australia, Africa, India, Southern USA and Mexico). This is cheaper than the above but still quite expensive, because the energy would have to be transported over long distances and it is very vulnarable against terrorism and political unrest because there plants are huge, difficult to defend and easily destroyed. This is the reason why DESERTEC died. DESERTEC was a project trying to connect Europe with Northern Africa, using parts of the Sahara desert to produce clean sustainable Solar Energy for both. Then the „Arab Spring“ came and there is no way anyone will risk their money in the failed states (or should I say „felled“ because the forces came from outside?). It is sill a great option for India, the USA, Mexico and possibly Canada in cooperation, very good news also for Australia and the countries of Northern Africa as soon as they find back to polical stability. Nuclear Fission of U238 and Th232 in new secure reactors that cannot be used by military, that do not need enrichment, that can burn the nuclear waste of today, that do not need transport of dangerous goods, that cannot explode, that cannot leak radioactivity to the environment even if the machione fails completely, that leave very small amounts of relatively harmless nuclear waste that can be kept on site for the 300 years it need instead of the 1 Million years of the stupid non sustainable reactors we use today. It has the potential do deliver 20.000 years of clean and cheap energy at the rate of 9 Billion people using 80kWh/day. There is a theoretical third option, Nuclear Fission of Deuterium, but currently noone knows how to do this. Because Seawater contains a lot of Deuterium we could burn it for Millions of years to meet any energy requirement, humanity might have. With Nuclear Fission of U238 and Th232 we have time enough to put more research into this. We might even get the activation energy from Nuclear Powered Lasers, but I do not know enough about these yet to judge. To be able to inform my readers in the most pleasent and correct and funny and understandable way. And then sometimes a book like this comes along and helps me recreate. Wonderfully made. Full of inspiration. Full of great examples that fit nicely in my line of work. Very well researched and written. A breethe. Get it. Read it. Enjoy it. If there were no other such book on my list, I would call this the best, but as there are, this is „only“ one of the best. What is it about, this self-proclaimed „Users Guide for the 21st century“? I focusses, one after the other, on all the aspects of our lives and finds practical examples for better, practical and proven solutions to do things in a better, more sustainable way. I am very happy to have found this book!